Often thought of as a stressful time of year, Christmas can in fact be just the opposite. A time for family traditions, meeting up with old friends and new, gathering with family for much eating, drinking and merriment. The run up to Christmas Day itself can be daunting, but it needn’t be. If you break it down to a series of events to look forward to, and well-planned preparation for all to get involved with, the period of festivity truly can be a magical time of year. 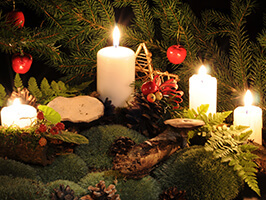 Most of us have inherited a legacy of Christmas decorations from previous generations but there are also some wonderful ways to bring the outdoors inside over the month of December. Whether you put up decorations from December 1st or if you leave it to Christmas Eve (if one is being strictly traditional), foraging for pine cones, holly leaves and berries, mistletoe and sprigs of pine can make the most beautiful decorations for inside the home. Try pricking clementines with cloves to fill rooms with the scent of Christmas, mulling wine equally tastes delightful and smells magical. And forget not the joys of making the Christmas pudding. Stir Up Sunday is traditionally the day for gathering family around the kitchen table to each make a wish and stir the pudding. Falling on the final Sunday before the start of Advent this can be the first family event to really treasure and build up excitement for the month to come. If you’re still looking for the perfect Christmas pudding recipe then do have a look at our recipe here. Further cooking fun is to be had with the making of traditional mince pies. These needn’t be saved for Christmas day, and are another wonderful way to fill the house with the smells of Christmas. Plan to make 2 batches, one for the run up to the big day, and another to enjoy on Christmas day evening and Boxing day. For the ideal mince pie recipe click here. If struggling for ideas as to what to buy for loved ones this Christmas, why not try the gift of homemade food? Not only are they delicious but show real thought behind each gift and can be wrapped so as to sit beautifully under the Christmas tree. For some wonderfully simple, flavourful gift ideas why not try our Denhay bacon chocolate truffles , potted ham or our Denhay Christmas chutney? Whether entertaining friends, family or both, Christmas Eve is a great time to gather round, eat drink and be merry. Traditionally, games such as Charades, hunt the thimble and blind man’s buff are played (if nothing else presenting an opportune way to tire out excited children!). But during the day of the 24th, you can take this time as a family to prepare for the feast of Christmas day itself. Get everyone around the table to peel carrots and parsnips, potatoes and sprouts. Make up the stuffing in advance – all things that will make the big day run smoothly and with minimal stress. One thing that children love to do is to get involved. Why not charge them with making place settings for everyone or perhaps writing up the Christmas day menu? Of course, no Christmas eve would be complete without the hanging of stockings over the fireplace, or at the end of beds. Don’t forget the all-important mince pies with a dram of whisky for Saint Nicholas and a carrot for Rudolph. Whether you open gifts first thing in the morning or save them for after Christmas dinner, today is the day to enjoy the company you’re with, be thankful for all you have and eat heartily. Start the day with a wonderful Christmas breakfast of Smoked Salmon and Eggs; filling enough to see you through to lunch without weighing you down. Needless to say, breakfast should be accompanied by coffee and a glass of bucks fizz. A small starter is a lovely way to begin the family feast. Try our potted gammon on top of toasted bread of your choosing. Simple, delicious and a great prelude to the main event. Christmas dinner itself is a thing of tradition and personal taste in equal measure. Assuming you stick with traditional turkey for lunch, there are 2 ways you can approach the cooking. Slow cooked turkey is a great way to ensure a moist bird without eating up precious oven space (just ensure that your slow cooker is large enough to accommodate the turkey!). And brining your turkey is an equally wonderful way to make sure you don’t eat dry meat with your Christmas trimmings. Preparation for this needs to start at least a day before so it does take longer than traditional cooking methods but is most certainly worth the wait! If there is any room left after your hearty Christmas feast, then pudding is a wonderful thing equally full of tradition. You, of course have already made the Christmas pudding with all the family – begun on Stir Up Sunday, and if you can’t quite face the rich fruit pudding with brandy butter, perhaps a mince pie with some coffee would be a better option. Be sure to properly enjoy pudding though – many opt to leave pudding for an hour or so after dinner so there’s plenty of room for the grand finale! And of course, Christmas cake with tea for later in the evening. Boxing Day. A sleepy day to play with yesterday’s presents, take a stroll to blow off any cobwebs and to continue indulging in yesterday’s leftovers, cold-cuts and chutneys. Now is the perfect time to unveil your cooked ham. An award winning Denhay Gammon Joint makes the ideal centrepiece for the Boxing Day table. Our blackcurrant glazed ham is wondrous and especially good with any cranberry sauce left over from yesterday. And with a good port to round it all off, some fine Dorset Cheddar and plenty of chocolates to indulge in, sit back and relax knowing that this Christmas has been a superb one!